Yet much as ‘beauty is in the eye of the beholder;’ so it is that whether positive précises are derived, whether lasting lessons can be learned, whether constructive courses of action can be formed, whether we see the cup as not being empty — depends so on our resiliency and resolution as native trout enthusiasts — and our inclination to hope for, and to do, all that we can in behalf of a remnant of a strain of trout that may now simply number in the dozens—a few dozen—in a hatchery environment ran by employees of the State of Oregon. Early in July we were on the system, looking for ‘friends’ in all of the usual places . . . Yet, as we approached our customary haunts we encountered more than just the foreboding sense that the drought is taking a toll on the system and the trout that are present in it. As quite an eerie backdrop: The Refuge Complex had undertaken a Prescribed Burn in the area late last year: Which left only the charred remains of the shrubs and Junipers that we had formerly used as markers to easily locate our favorite fish hideouts . . . And an ashen texture to the ground, which testified of the minimal precipitation the region has received. 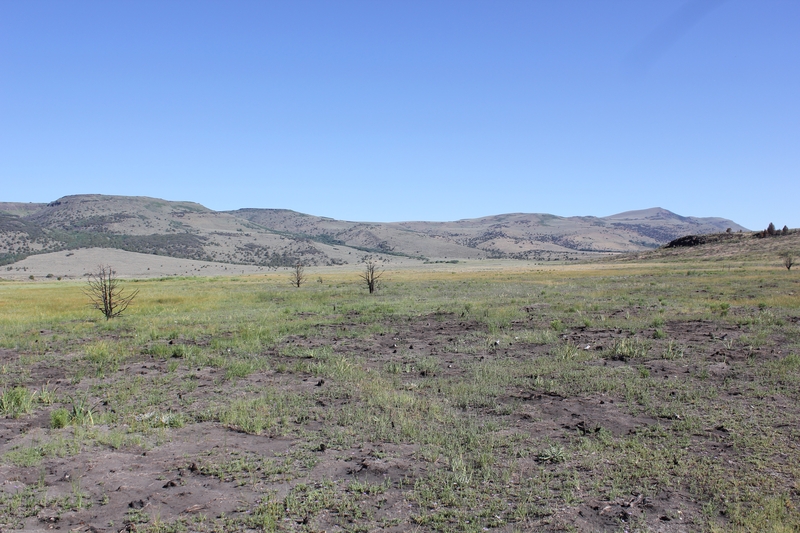 Approximately 450 acres of cut juniper were slated to be burned, as well as 400 to 500 acres of meadow grasses in the meadows and springs areas. Another 125 acres higher in the system were also slated for burning by the U.S. Fish and Wildlife Service. As a testimony to the drought . 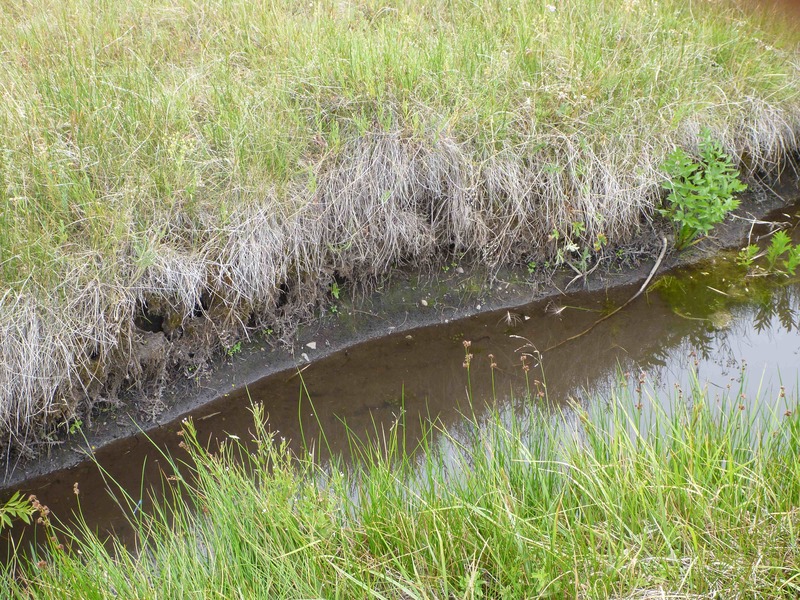 . .
What were historically deep holes along cut banks covered by long grass were now little more than puddles with sparse cover and little flow to sustain trout through a hot summer. As we are normally inclined to do; we walked along the System looking for shady pockets and hiding places that the trout use to survive the warmer water and diminished oxygen. Those hiding places simply were not there. As we traversed a couple hundred yards from our favorite region in the system, I realized that the water flow was roughly the equivalent of just what our garden hose produces . . . But it was now already warmish early in July: and we knew of a certainty that the worst of the heat and drought were yet to come . . . There are sections that we have enjoyed fishing and catching Alvord phenotypes in the past (just the year before last), yet . . . I didn’t have the heart to pursue those areas — because I have no doubt but that they are dry. While the saying is that a ‘picture is worth a thousand words,’ and some of the pictures are ‘telling’ in that they reveal reality and tell the whole story where this drought is concerned: I believe that I would be remiss to not include some of the correspondence, and photos, from Cyril — who was on the system later in July than we were. Off line, in additional correspondence with Cyril, I reiterated the experience we had earlier in the month. Of course, I let him know that we would love to see his photos of the system. 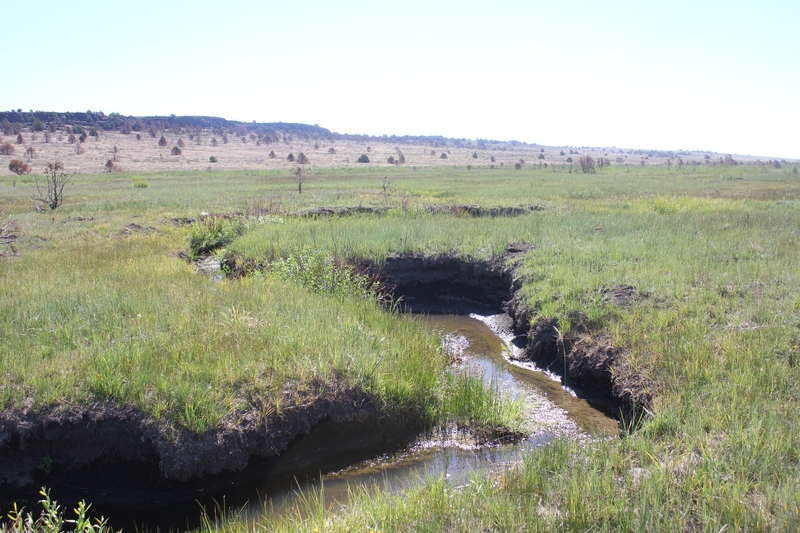 We also talked about the fact that there have been other severe droughts that at least a remnant of the trout seemed to have survived. Perhaps the juveniles have lower oxygen requirements, or perhaps the resiliency to hide and hang out through such difficult times. 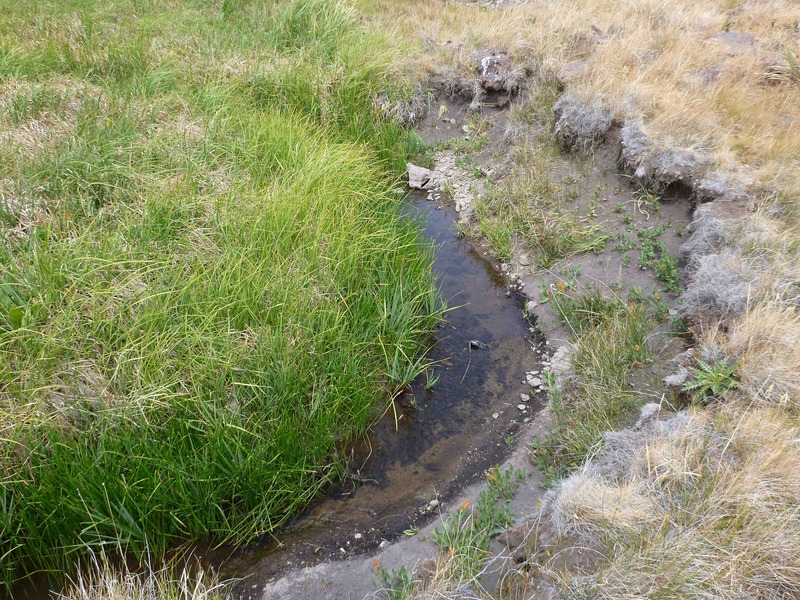 A stagnant pool (top) and a trickle of a flow (above) are pretty much all one can find . . .
Charred landscape along the way . . . not enough rain to bring the grass back into play . 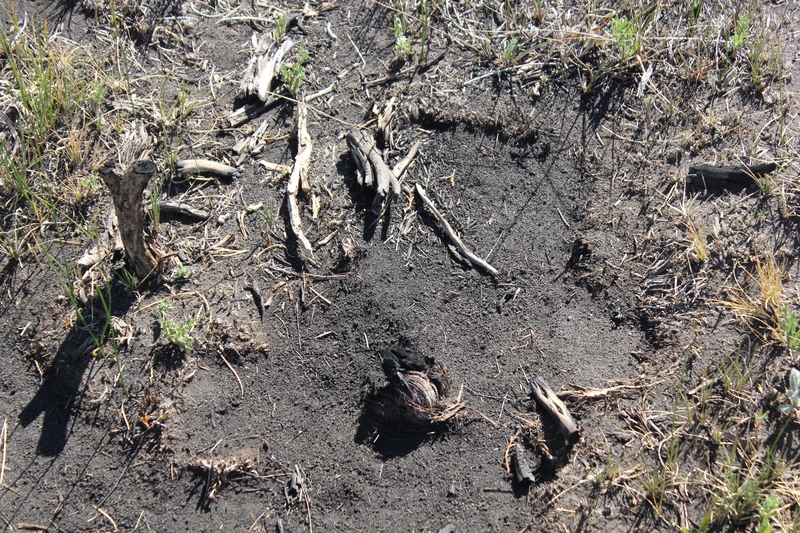 . .
And the charred remains of sage brush and other vegetation was still dominant overall . 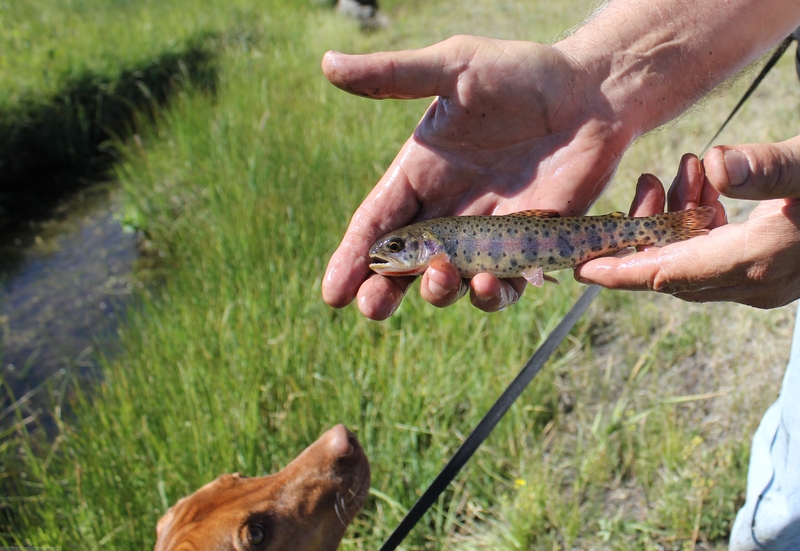 . .
Our Vizsla Dori admires a small pretty cutthroat with large parr marks and vivid spots . . .
Miraculously, there were still trout surviving even in these ridiculously horrid conditions. Given opportunity, we hope to make a pilgrimage to the system in August . . . though we hope it will not be like a funeral procession just to validate the corpses along the way . . .
More than ever, we hope that native trout enthusiasts and biologists for the State of Oregon will be truly putting our and their hearts and minds and beings into action; to care and to critically think through the best plans and course to preserve the few dozen trout in their care that may represent the last of the genetic legacy of the Alvord cutthroat trout. 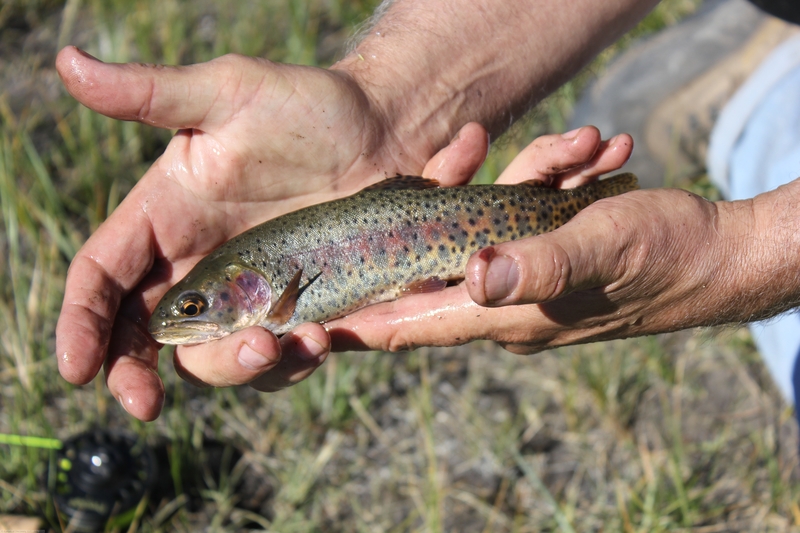 It has been shown to be that it was a timely miracle for Shannon Hurn to capture a baker’s dozen of Alvord phenotypes last spring — and that one was a female — of which now a few dozen progeny still hopefully survive; as potential heirs of the legacy of an extinct strain of desert cutthroat trout. 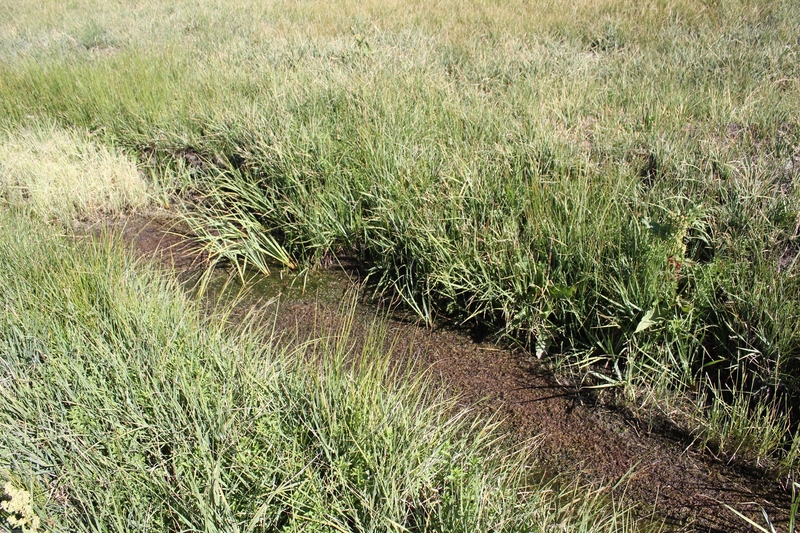 This entry was posted in ***** Creek Sampling, Observations, Of Fauna and Flora, Photo Journals. Bookmark the permalink. With these conditions, I find it abhorrent to see you continue to angle for obviously stressed fish including one shot with blood on your thumb. ODFW or F&W should be putting an emergency closure in effect. Hello Michael. If you look more closely, you will see that it is a blood Blister caused by a poorly placed hammer blow at home. I understand your concern; but just to let you know: we not only use fine-wire barbless hooks – but a bucket of clean oxygenated water – which the trout immediately go into – which then allows for a quick photo and then a very quick release back into the stream. 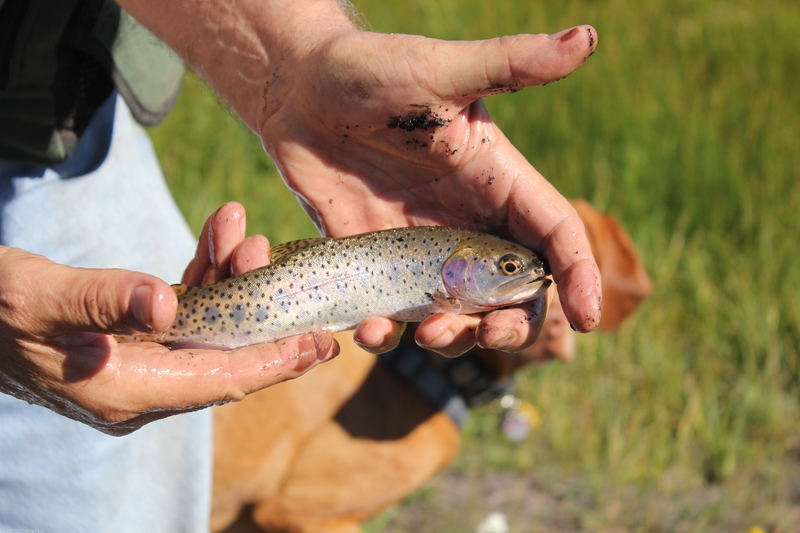 None of these trout were impaired or adversely affected during this catch and release. We keep such concerns in mind, as we have always had the priority to only preserve the lives of the Alvord phenotypes while documenting the reality on the stream environment. Hello Joe. Absolutely valid question. US F&W plans these burns long in advance, and they did this burn in the late fall . 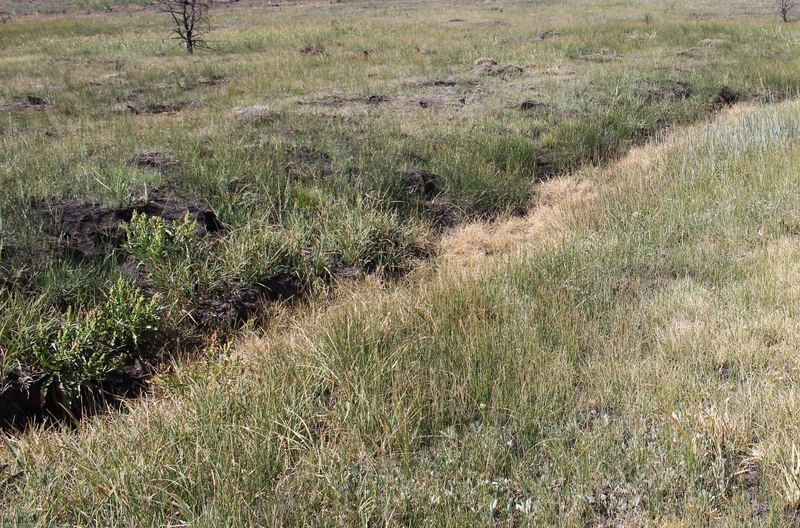 . . No doubt, expecting that precipitation would restore grass in the sub-basin. But the drought has left any moisture content at a bare minimum. It seems that there has been some ‘unseen force’ trying to wipe-out any remnant of the Alvord cutthroat trout and its progeny. And now there is more impetus than ever that the hatchery Alvord phenotypes should be handled with the utmost care and consideration . . . so they can truly carry forward any remaining genetic and phenotypical expression of the Alvord cutthroat trout for future generations to behold and appreciate. 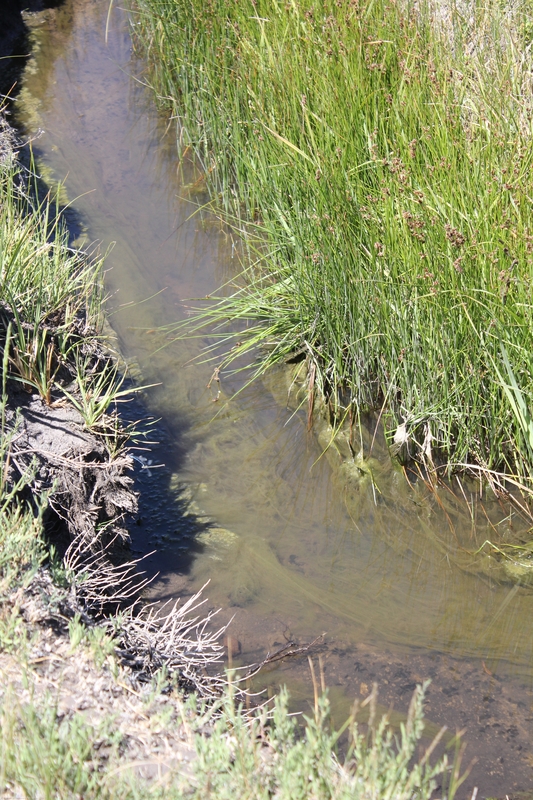 It’s very concerning to see the condition of the creek in those photos. This year will really test the resiliency of the inhabitants. Will the few dozen yearlings be given the care they deserve now that Shannon Hurn has moved to a new position? Hopefully, they will not be dumped into a raceway holding rainbows and planted in some put and take fishery by some unsuspecting newbie. Stranger things have happened. Thank you for your continued interest and willingness to share your findings.